Many people are striving to save more money this year, but they don’t know where to begin. Others make a valiant effort to save more money at the beginning of the year, but by Spring Break they are ready to give up on their goal. 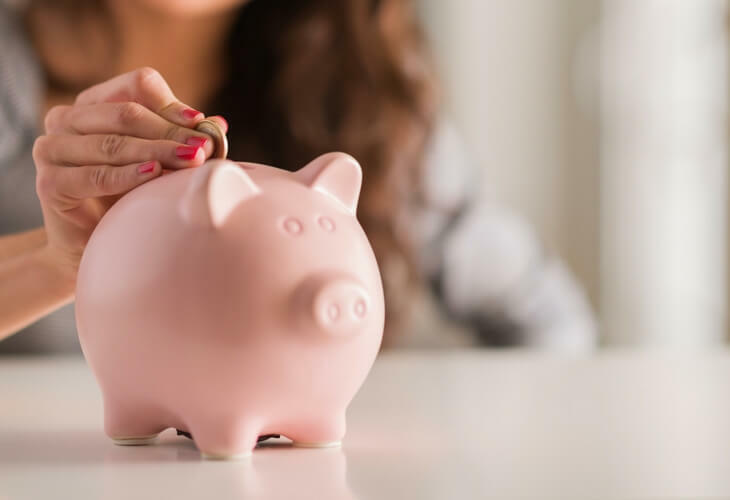 This year you can make sure you save more money by creating accountability, and use your competitive side to your advantage with one of these savings challenges. Plus, I even created some helpful downloadable worksheets to help keep you on track! I bet you’ve already heard of this savings challenge because it’s pretty popular on Facebook and other social media networks this time of year. In this savings challenge, you set aside $1 the first week of the new year (or whenever you decide to start the challenge) and increase your savings amount by $1 each week. For example, on week one, you’ll save $1. In week two, you’ll save $2. Then, by the time you reach reach week 15 you’ll save $15. By the end of the year, you will have saved $1,378! The end of the year can be the challenging part. When the holidays hit and money is already tight, you will need be saving around $50 per week to stay on track with the challenge. If you are on a tight budget, it might be difficult to complete the entire challenge. Luckily there are some alternatives that might fit your lifestyle, and budget, better. Take the amount of money you want to save this year, or the amount you’d save in the normal 52 Week Savings Challenge, and divide it out evenly among the 52 weeks of the year. This will allow you to save a flat rate each week instead of increasing your savings rate throughout the year. Saving a flat rate of $26.50 for 52 weeks will add up to the same amount as the regular 52 Week Savings Challenge. But, even if you only set aside $5 by foregoing your weekly latte at Starbucks, you’ll still have saved $260. As mentioned, one of the hardest parts of the 52 Week Savings Challenge is setting aside $50 per week during the holidays. One way to modify this challenge and solve that problem is by doing the challenge in reverse. You can start out by saving $52 on week one and end the year with $1 on week 52. This might be easier if you get a bonus or tax refund during the beginning of the year to help fund those larger savings weeks with your extra money. In this modification, you can choose to save any amount you want each week, from $1 to $52. This allows you to have more flexibility. You’ll be able to save more when you have extra money. Or, you can choose to save a lesser amount when your budget is tight. Each week, cross the amount you saved off the list. You won’t save that exact amount again during the remainder of the challenge. If your budget is really tight, you might not be able to set aside $1,378 over the course of year. Taking part in this mini challenge will help you save money on a smaller scale. The mini version of this challenge uses $0.50 increments instead of $1 increases each week. It’s just like the 52 Week Savings Challenge but cut in half. You save $0.50 the first week and end the year saving $26 on week 52. The total savings will also be half at $689. If you prefer a daily action instead of a weekly action to make saving money a habit, try the 365 Day Savings Challenge. 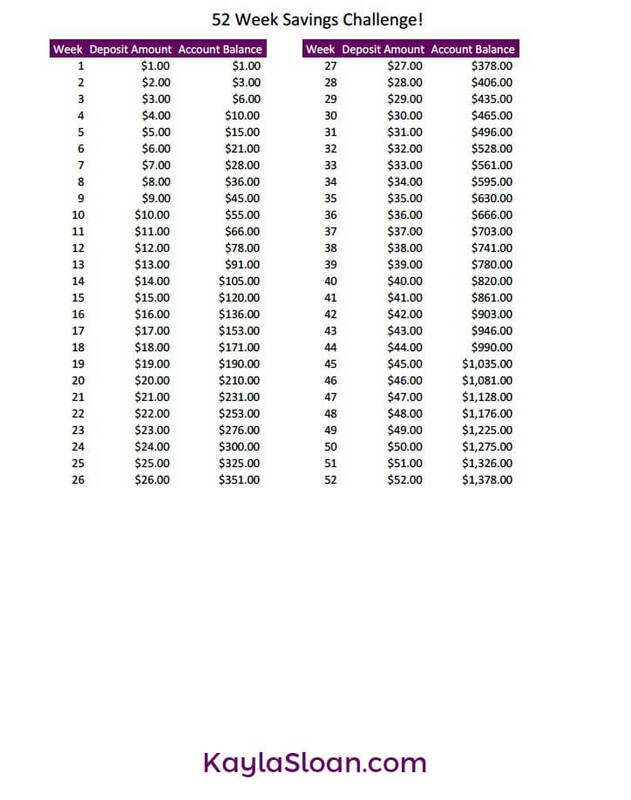 In this challenge you set aside $0.01 on day 1, $0.02 on day 2, and so on. On the last day of the year, you’ll save $3.65. Even though you start out just saving pennies, this challenge will result in a total savings of $667.95 at the end of the year if completed correctly. To help you get started on the right foot with any of the savings challenges in this post, I’ve created some FREE downloadable worksheets. These worksheets will serve as your guide throughout the year to keep you on track with your goals. You can fill in your information as you meet the savings goal each week, or just cross through them like a to-do list. Each of the challenges is in a separate section in this downloadable worksheet. Just enter your email below to get a copy of my worksheets so you can start with one of these savings challenges today! If you’re already living on a tight budget, it may seem impossible to find money to set aside for these challenges, but I promise it’s not! There are plenty of ways you can find more money to save. One way to find extra money is to examine your budget any cut any expenses you can. Instead of eating out weekly, try eating out only once every two weeks. Or you could cancel cable and get Hulu for only $7.99 per month. You could also switch your cellphone plan to Republic Wireless. Plans with high speed data start at $20 per month for talk, text, and data. If you’ve already cut everything you can from your budget, it may be time to side hustle and earn more money instead. You could take surveys online with Survey Junkie during commercials of your favorite shows on Hulu or during your morning commute, or start driving with Uber. If you’re not a people-person, you could also choose to deliver food with Uber Eats. My favorite side hustle is being a virtual assistant (VA) because you can work from anywhere, anytime, which makes it the perfect side hustle for busy people. I worked as VA on the side for a year before taking it full time and now I earn over $10K/month! Find out how you can become a VA and earn thousands with my new course, $10K VA.
My favorite choice for a high-yield savings account is Synchrony Savings. Synchrony and Barclays both have a rate of 2.05%. Both have no minimum balance or monthly service fee. Savings challenges are a great way to make sure you save more money this year, but it’s also important that you use that money wisely. You can choose to put your challenge savings into your emergency fund, invest it, put it toward debt as a lump sum payment at the end of the year, or to pay for Christmas gifts for your friends and family. All of these are good ways to use your savings challenge money if it will prevent you from taking on debt. Plus, savings challenges help you build a new savings habit that you are more likely to continue after completing the challenge. Have you ever done any savings challenges? Which one did you use? In 2015, I did the 52 week challenge – doubled. I wasn’t saving for a specific goal until maybe April/May. I decided I would use the funds for travel and was able to pay for our trip to Philadelphia. I would definitely do this challenge again, but next time I would do it reversed. Awesome! I tried the regular 52 week challenge in 2014, but I failed miserably. I did pretty well until it got to like $30+/week. I used the money I saved toward Christmas and birthday gifts for friends and family. If I did it again I think I’d just stash it in a savings account instead of keeping a pile of cash around to tempt me to spend, plus I’d probably do the elimination version so I have more flexibility. I’ve never done either — or even heard of either — but they’re interesting. I may have to try the weekly one, but our expenses tend to be all over the place. So we’ll have to see how well it works. I am so excited to take on the 52 week savings challenge. I’ve never been successful yet with any savings challenge, so I am making sure that this year, I’ll be successful at this one. Hashtags determination and candoattitude. Happy New Year, Kayla. Awesome James! I hope you are successful with it!